Cryptopay FAQ: how to buy bitcoins? what is crypto card? etc - How do I create a new Bitcoin address? All Categories › Exchange between accounts › How do I create a new Bitcoin address? For your convenience, we have made it possible to create several Bitcoin addresses linked to a single wallet within your Bitcoin account. Your transaction history can become a bit overwhelming and difficult to navigate. What if you need a particular deposit or a group of deposits shown separately from all the others? For this purpose, you can create a different Bitcoin address so that you can clearly see what amount you were sent in the particular case. You may want to create a new wallet address for some other reason or even without it. With Cryptopay you can do that hassle-free and have different addresses for one wallet! Here is a small guide on how to create a new address within your Cryptopay wallet. You can create a new address for every account (BTC, LTC, XRP, EUR, USD, GBP) you have in your Cryptopay wallet. On the Accounts page click the name of an account you wish to create a new address for. 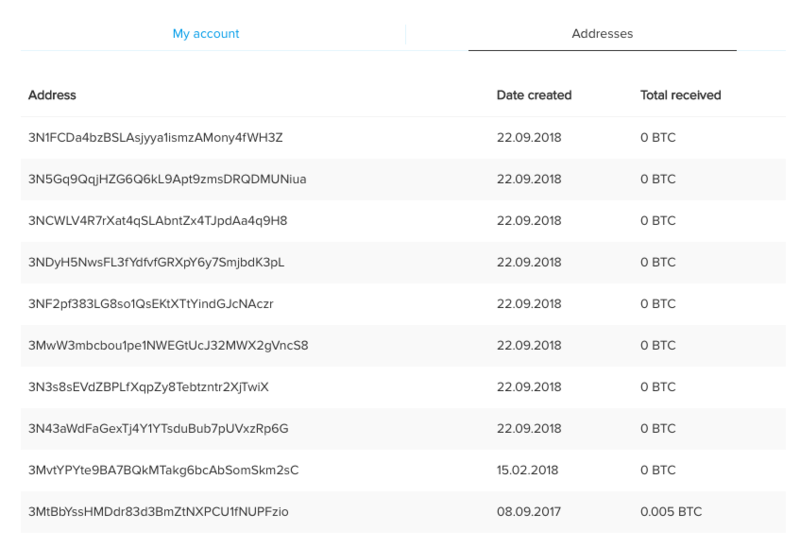 In the "Addresses" tab you can see all created Bitcoin addresses, the date of their creation and a total amount received on each address. You can create multiple Bitcoin addresses and each address will be active and could be used to send funds to. Deposited funds will be displayed in the same single wallet on the Accounts page.